Classical music historiography of the 20th century tends to create neatly delineated periods, with World War Two creating a kind of indelible caesura in all things aesthetic and philosophical. This is particularly true in Germany, where the Nachkriegszeit (post-war period) is defined as a veritable epoch: a time in which the country rebuilt itself as a reaction to the horrors of National Socialism, both in politics and art. A concert at the Jerusalem International Chamber Music Festival, which explored both the centenary of World War One and Richard Strauss’ 150th anniversary this year, managed to throw this construction into question. 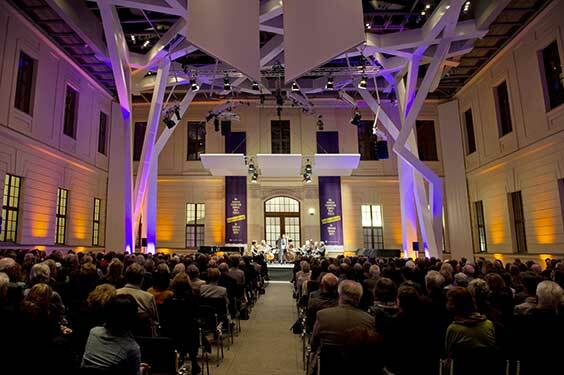 The program on May 10 at Berlin’s Jewish Museum opened with a new work by David Robert Coleman, a German-British composer who blends serialist rigor with free-formed contemporary timbres and structures. His Three pieces for Clarinet and Piano creates a whimsical dialogue between the two instruments which builds from emotional disjoint into an intense exchange culminating in banging piano chords. The clarinet, meanwhile, reveals how the soft-spoken can hold the upper ground, ending the piece with quiet trills, like a wife trying to placate her angry husband. Berlin Philharmonic Principal Clarinettist Andreas Ottensamer showed off his slick virtuosity in the more playful, fast inner piece, with a Klezmer-inspired cadenza that yielded to a complex interlocking with the piano, performed by Coleman himself. The third piece had a more post-Romantic feel demanding tremendous breath support from Ottensamer in the serenade-like melodies that yielded to desperate pleas. Her dramatic poise and sharp musicianship were also on display for two Anton Webern song cycles, even if she was at times a bit too precious. The craggy melodies of “Nachts” from op.14 seemed to descend from a quicksilver tap while Coleman led the five-piece chamber ensemble in a precise reading. 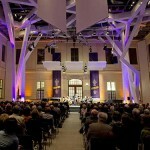 Such fine musicianship could have benefitted more intimate acoustics than the museum’s covered courtyard. The two Romantic works on the program emerged as a kind of lament for European civilization in its civilized, tonal splendour. Violinist Guy Braunstein’s emotional intensity was not always a clear match for the more understated playing of cello doyen Frans Helmerson in Felix Mendelssohn Bartholdy’s D-minor Piano Trio, although they often created a moving blend, such as in the inner Andante. Jonathan Gilad, stepping in for Andras Schiff, understandably had to warm up to the piano part’s undulating fingerwork but gave an impressive performance under the circumstances. Richard Strauss’ neo-baroque incidental music to the Molière play Le Bourgeois Gentilhomme, in a new arrangement for chamber ensemble by Braunstein, was an interesting choice to close the program. The Lully-inspired melody of “Cleonte’s Entry” was weighed down in nostalgia as it gravitated to horn (Cenk Sahin) and bassoon (Mor Biron). Braunstein led the numbers with the authority of a musician who had assimilated every melody while also integrating his rich tone. Flutist Gili Schwarzman stood out for her elegant grasp of the dance tunes. The weekend continued in a French baroque vein at the Komische Oper with Rameau’s drama Castor et Pollux. Intendant Barrie Kosky’s production, which premiered at the English National Opera three years ago, opts for the composer’s 1754 revised version which, eliminating the characters of Venus and Mars, depicts Castor’s murder by Lyncée’s troups before launching into Pollux’s supplication of Jupiter to restore his twin but mortal brother back to life. Seen at its Berlin premiere on May 11, Kosky foregrounds the human violence of the first act with cinematic-like kicks and groans. The mundane aspect is driven home through an aesthetic of bare wooden walls and bourgeois modern dress (sets and costumes by Katrin Lea Tag), with a pile of dirt to represent Hades. In the absence of any choreography whatsoever, Kosky fills dance numbers with actions such as a view of the chorus’ feet in a jamming free-for-all. During the chorus “Que tout gémisse,” the abandoned Télaïre slaps the bloody hands of the murdered Castor against her bare thighs. And when she realizes that both he and Pollux have left her behind on earth in the final scene, she runs up against the walls like a schizophrenic in an insane asylum. The scene finally gained an ethereal quality in keeping with the tension between gods and men with streams of glitter that poured onto the empty shoes of the brothers. Kosky’s direction aside, a Rameau opera demands from its cast fastidious attention to ornamentation, beautiful diction and phrasing that creates an inextricable synthesis between text and internal drama. Allan Clayton possesses a powerful, attractive tenor, and warmed up to give a moving performance of his final aria “Qu’il est doux de porter vos chaines,” but, alas, is no early music singer. As Télaïre, soprano Nicole Chevalier similarly made no doubt of her fine instrument but did limited justice to the score’s finer nuances. Meanwhile, it was the tenor Aco Aleksander Bišćević, in the small role of Mercury, who demonstrated enormous vocal agility. Scottish conductor Christian Curnyn also proved a redeeming factor as he led an ensemble of the Komische Oper Orchestra in a clean, vigorous performance that, although a bit square, revealed painstaking attention to detail. For more by Rebecca Schmid, visit rebeccaschmid.info. This entry was posted on Friday, May 16th, 2014 at 6:15 am	and is filed under Berlin Times. You can follow any responses to this entry through the RSS 2.0 feed. Both comments and pings are currently closed.